Most people don’t think of a hatchback as a performance vehicle. Perhaps they need to be introduced to the Volkswagen Golf R.
The Golf R is arguably the quickest hatchback out there. It certainly takes one by surprise, considering it looks very similar to other Golf models, leaving the assumption that performance is not really its thing. But performance is exactly what sets the Golf R apart from its rivals. Let’s get right to the numbers. 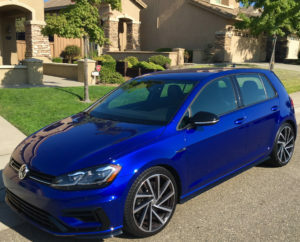 The 2018 Volkswagen Golf R offers one engine, a very lively turbocharged 2.0-liter, four cylinder that generates a whopping 295 horsepower and 280 pound-feet of torque. Although the Golf R has been around since 2015, oddly it hasn’t found an audience among U.S. car buyers. Yet it still remains one of the world’s best-selling cars. Perhaps the lack of interest among U.S. buyers stems from the price. The Golf R has standard all-wheel drive and starts at approximately $39,900, and the ceiling is around $41,000. Most people may think that’s a bit too high for a hatchback. And those same people may lower their sights a bit and consider the Golf GTI instead. A popular hatchback that has been warmly embraced by American car buyers, the GTI starts at around $27,400. It can’t match the Golf R in performance, yet the GTI is no slouch. It’s a turbo 2.0-liter, four cylinder that generates 220 horsepower and 258 pound-feet of torque, and goes 0-60 in 6.3 seconds. That’s plenty quick by most people’s standards. So, when choosing between the GTI and the Golf R, the decision ultimately comes down to price versus superior performance. And that’s a tough call to make. Critics of the Golf R say it doesn’t distinguish itself enough from the basic Golf exterior look, while the GTI delivers lots of bang for the buck. There’s no denying the Golf R is fun to drive. Note that the six-speed manual transmission comes standard and the 7-speed automatic transmission is an option. We found the manual version easy to operate and profess that shifting gears makes a performance-laden car more fun to drive. And that was the case with the manual transmission Golf R, especially on some winding back roads where it handled excellently in demonstrating its sporty nature. It grips the road assertively and gives the driver a real feeling of confidence. The Golf R also receives high marks for its interior. It’s nothing fancy, but the cabin is smartly designed and feels pretty spacious. It features leather upholstery, an 8-inch touchscreen that offers sharp graphics, and includes Apple CarPlay and Android. Up front, the Golf R has10 power adjustments and a tilt-and-telescopic steering wheel, allowing the driver to dial in that just-right position. The back seat provides good leg and headroom. The cargo area is surprisingly big – 22.8 cubic feet behind the rear seats and 52.7 cubic feet with the seats down. Our one primary knock on the Golf R interior is the center armrest is frustratingly not a console (it sure looks like one), so there’s no additional storage space. If given the opportunity, most people will find the 2018 Golf R and engaging hatchback that offers great acceleration and other niceties. The one drawback is price.